1. King of Lachish, and one of the five kings who, entering into a confederacy against Joshua (Josh. x. 3), were killed by the latter at Makkedah (see Adoni-zedek). 2. According to II Sam. v. 15, the eighth of the eleven sons of David born in Jerusalem, but according to I Chron. iii. 7, xiv. 6, the tenth of thirteen sons born there. 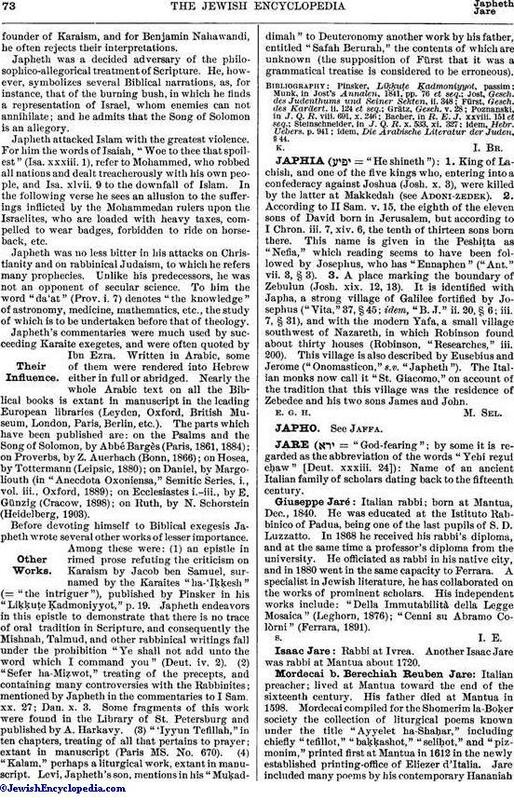 This name is given in the Peshiṭta as "Nefia," which reading seems to have been followed by Josephus, who has "Ennaphen" ("Ant." vii. 3, § 3). 3. A place marking the boundary of Zebulun (Josh. xix. 12, 13). It is identified with Japha, a strong village of Galilee fortified by Josephus ("Vita," 37, § 45; idem, "B. J." ii. 20, § 6, iii. 7, § 31), and with the modern Yafa, a small village southwest of Nazareth, in which Robinson found about thirty houses (Robinson, "Researches," iii. 200). This village is also described by Eusebius and Jerome ("Onomasticon," s.v. "Japheth"). The Italian monks now call it "St. Giacomo," on account of the tradition that this village was the residence of Zebedee and his two sons James and John.